Perfect for photo / light tents and other small jobs, maybe even for bigger locations where you can spread those 250W of light. In short: I'm going to get a couple more of these. Compared to others this one has a thicker and more solid dome. It has a good length power cord with a European power plug. 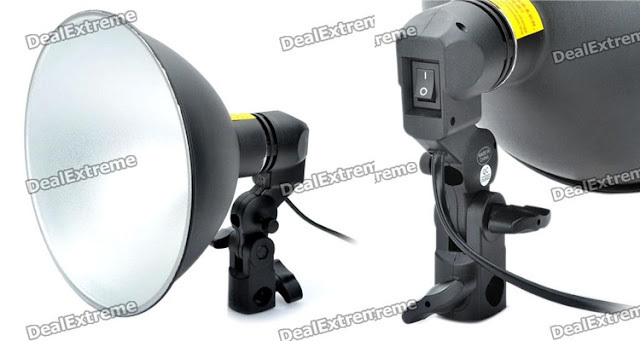 On the lamp there is a attachment hole for umbrella or other equipment. The plastic feels solid and the aluminum is lightweight and still thick enough to handle some packing and unpacking and general use. Not many cons for this price, but if I had to be picky you can always use longer power cables and it could have been bigger. But then again the size isn't an issue since it is supposed to be small and easy to place.